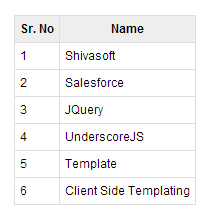 Below Example shows how to render JSON in tabular format using Underscore.js and JQuery. Line 31, we are going to append data in this table. Line 42-48, defines template on how we are going to render JSON values. We are looping through values and rendering in “td” tag of “table”. Line 73, Single line is doing the magic here. It is getting template which is defined between line 42 and 48 and then rendering values in table defined at line 31. Please leave comment for feedback. Previous Previous post: Why should I use JSON over XML ?